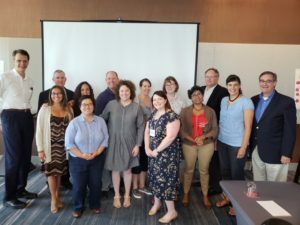 The second group of state health policy officials completed the Fund’s Emerging Leaders Program (ELP) in late June. Fifteen executive and legislative officials from around the country gathered in Nashville, Tennessee, for the program’s final in-person session. Since its creation in 2015, ELP has become known as a way for up-and-coming individuals from the executive and legislative branches to develop skills that will enhance their effectiveness in today’s complex health policy environment. Modeled after and sponsored by the Fund’s Reforming States Group (RSG), the ELP fosters the same kind of learning and networking experience for young leaders. Individuals are invited by RSG members to participate. The one-year program included two in-person meetings, two virtual sessions, and being paired with an RSG mentor. The curriculum focused on developing negotiating and communication skills in sessions led and developed by Ken Kizer, MD, MPH, director of the Institute for Population Health at the UC Davis Health System, and Richard Callahan, DPA, professor, School of Nursing and Health Professions, Department of Population Health, University of San Francisco. The meeting also provided participants with time to network and engage with veteran policymakers from the RSG who shared their experiences and with peers from around the country, who have a common interest in improving population health. After the meeting, participants noted that the most helpful aspects of the program were the open interaction between the staff and participants, particularly exchanges with those who have real-world experience in policymaking. They also found great value in connecting with their peers in a safe, bipartisan space, appreciated the self-reflective part of the curriculum, the opportunity for face-to-face meetings with mentors, and the ability to broaden networks. Many inquired about opportunities for program alumni to gather in the future. Elizabeth Roberts, former Rhode Island state senator, who currently serves as consultant to the Fund and is a former RSG member, participated as a mentor.